Brazil arouses a series of popular imaginations that are thematically poles apart but all together make it a country of mythical proportion. If half of the world population cheers at a back head shot from Pele to Ronaldo, the rest don’t mind to do a jig on the beats of Samba. From the colourful passion of the carnivals to the virgin wilderness of the Amazon rain forest, throw away all the stresses of life in the sub-tropical winds and enjoy the essence of life. This is Brazil for you. Officially, the Federative Republic of Brazil, this South American nation is a land of gigantic proportion by all possible parameters. It ranks at the top in measure of area and population in the Latin American terrain. The vastness of Brazil can be gauged by the fact that the country’s political border is shared with every other country in South America, except Chile and Ecuador. Brasilia is the capital city of Brazil and the seat of Federal Government. The other best-known cities of the country are Rio de Janeiro, Manaus, Recife, Santos and Sao Paulo, the last one being the third largest in the world with a population of over 20 million. Brazil was first introduced to the world on the debutante year of sixteenth century by Portuguese explorers. 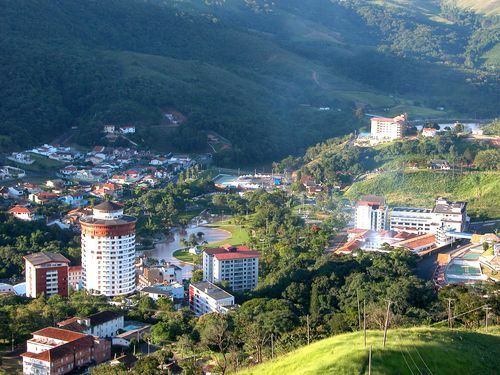 Its vast natural treasure, consisting of the gold, arable land and specially the brazil-wood that lends its name to the country, attracted different European settlers to its shores. Alongside the pristine Atlantic shores on the eastern frontiers, Brazil’s majority of landscape is drained by the colossal Amazon. The economy of the country has also prospered surrounding this fertile river basin. Brazil is a president ruled federal republic with teeming population count of 186,112,794. This fifth most populous country in the world is demographically diverse in origin. The majority of the population is basically a mixed race of African, European, and indigenous decedents. The native Tupí or Guaraní community forms a minority and reside by the Amazon banks. Portuguese is the official language but English is also widely taught as a second language. Some 90% of the population is at least nominally Roman Catholic. Brazil's land area is spread over a terrain of 8.5 million square kilometres (3.3 million square miles) and takes away nearly half of South America. The country borders stretches from the Venezuela, Guyana, Suriname, and French Guiana in the north to the plains of Uruguay, Paraguay, and Argentina in the south. In the west it is encompassed by Bolivia, Peru, and Colombia and in the east it protrudes far out into the Atlantic toward Africa. Topographically, Brazil is a diverse country with a lengthy coast line on east, the great Amazon river basin in the north, plateau and hilly regions on the south and equatorial rain forest on west side. 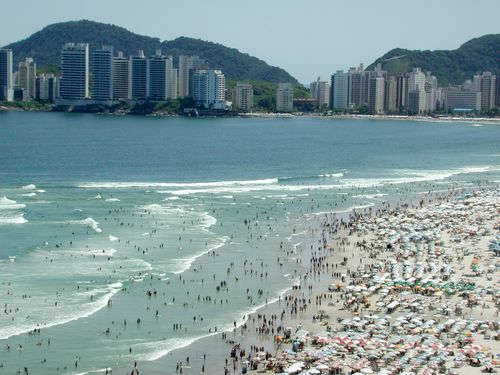 Brazil's population is concentrated in the major cities of its coast. The basin of the Amazon River and its tributaries covers almost half of Brazil’s territory. It is one of the world's largest rainforest ecologies. More than 66% of Brazil's land surface is still covered by forest. Unfortunately, a substantial proportion of this area has suffered the effects of urbanisation and deforestation to accommodate agricultural land in recent years. The Amazon is navigable upstream, for ocean steamers up to Iquitos, Peru. The Pantanal wetlands in the North and North West of Brazil mainland are one of the most extensive swamplands in the world. Southern Brazil is drained by the Plata system consisting of the Paraguay, Uruguay, and Paraná Rivers. Brazil’s capital city Brasilia is situated amidst the plateau regions with the rugged hills and mountains in the south and the Atlantic coast form the Brazilian Highlands. The highest point in Brazil, the Pico de Neblina at 3,000 metres (9,900 feet), can be found in these ranges. Over 66% of Brazil's land surface is still covered by forest. Brazil is a tropical paradise, the dream destination for lovers of sun and sand and adventures of dark forests. It is crossed by the equator in the north and by the Tropic of Capricorn in the south. 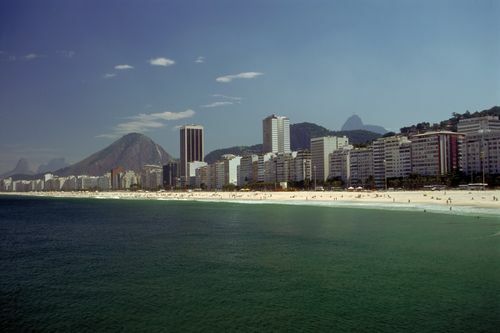 Most of Brazil's large cities are situated on the Atlantic coast or the banks of the great rivers and thus experience temperate sub tropical weather conditions. Brief rain showers, humidity and moderate winter months mark the weather conditions here. Down south, it gets really cold with surprise snowfalls in some years. The Amazon Basin is the wettest area, with damp and moist temperatures and is home to many rare species of wildlife and plants. There are some dry interiors too with only a few months of rainfall in a year. Brazil is one country in the world where a citizen from Lisbon will never feel homesick. Such familiarity of Brazil with Portuguese culture dates back to the "accidental" discovery of the country in the early sixteenth century. While sailors from different European countries were landing on the untouched shores of Latin America, Portugal took the credit to gift the world the land of brazilwood (Pau-Brasil). Poor historical data suggest that an indigenous population of Indians, mostly Tupí-Guaraní, inhabited the present terrains of Brazil. These scattered tribes were not as advanced as the Incas of Argentina. Nevertheless, they gave a tough time to the Portuguese settlers led by Pedro Álvares Cabral in 1500. So, the initial colonisation was slow and gradually, the native Brazilians became slave to the foreigners. 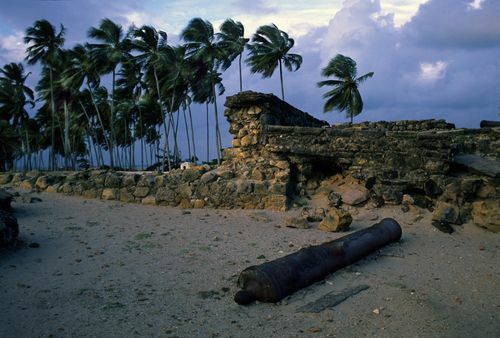 The first permanent settlement was not established until 1532 at Sao Vicente in Sao Paulo. Over centuries, Brazil became the most lucrative region of the New World territory and Portugal faced resistance from French and Dutch forces. Formal royal recognition came in early nineteenth century when, during the Napoleonic Wars, King João VI, fearing the advancing French armies, fled Portugal and set up his court in Rio de Janeiro. João had to leave the Brazilian shores for Portugal in 1820 following a burst of revolution there. He left behind his son as regent. When Portugal tried to re-impose colonial rule, the prince declared Brazil's independence on Sept.7, 1822, becoming Pedro I, emperor of Brazil. Pedro’s administration was a peculiar mix of monarchy and parliamentary democracy. Although the monarchy was in full force, it stretched out for a friendlier relation with the Brazilian aborigines by abolishing the curse of slavery. Pedro I was soon caught in a tussle between the democratic and monarchist ideologies and was replaced by Pedro II, who suffered a same fate of political dispute. In the last decade of nineteenth century, Brazil was proclaimed as a republic. However, it continued to be ruled by military dictatorships until a revolt permitted a gradual return to stability under civilian presidents. 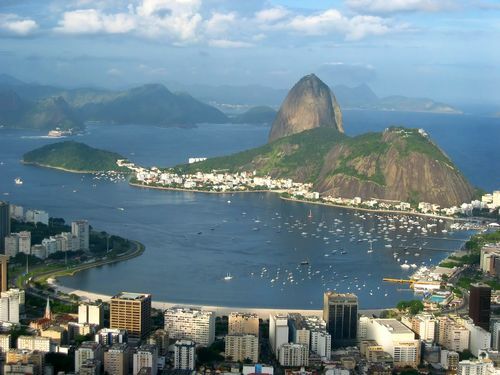 Brazil is the one of the glittering financial powers of the southern hemisphere. Today, it is the most highly industrialised country in Latin America and in 2000 was the world's eighth largest economy. Brazil’s economic success story is based on both natural and human contributed factors. Between these two pillars, natural resources form a major part of Brazil's wealth. The well-developed Brazilian agricultural and mining sectors provide employment to one third of the population strength. Brazil is the world's largest producer and exporter of coffee and orange juice. It also has hydroelectric power and a nuclear power program that support the industrial base. 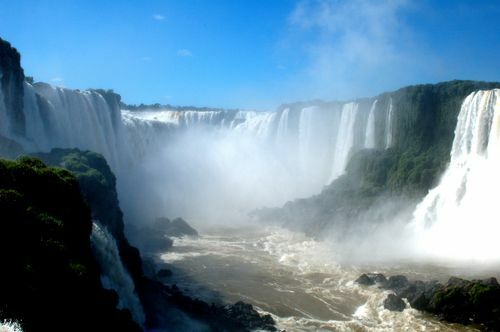 The hydroelectric potential of the country lies in the Amazon basin. Major exports include high technology aviation components and civilian aircraft. It is President Fernando Henrique Cardoso who introduced privatisation in the country. Brazil also topped in one of the negative factors of the economy; debt. It got some relief with support from the International Monetary Fund but the economy still remains stuck in the vicious circle of hyperinflation, currency creation and flotation. All these overshadowed Brazil in the first couple of years of 21st century. Brazil is a boisterous federal republic by choice of the domestic. It happened in 1993, when the Brazilian population voted for president-led government structure over parliamentary system and monarchy. Administratively, Brazil is divided into 26 states and one federal district. Each state has its own governor and legislature. Overall, Brazil is governed by a constitution that was adopted since 1988. It provides the necessary guidelines for segregation of powers among the legislature, judiciary and executive branch of the Brazilian political set up. According to the terms set in the constitution of Brazil, much authority is vested in the president. He, along with the vice president is elected for four years by universal suffrage. Under a 1997 amendment, the president may be re-elected once. The president is considered both chief of the state and head of the government in Brazil. He nominates and appoints the members of his cabinet and can unilaterally intervene in state affairs. The bicameral legislature of Brazil is known as the National Congress or Congresso Nacional. It consists of an upper federal senate or Senado Federal and a lower chamber of deputies or Câmara dos Deputados. The 81 senators are elected for eight years, among them the first one-third and the rest two-third face the election in an interval of four years. The 513 deputies also stay in the Hose for four years. The judiciary of Brazil consists of the Supreme Federal Tribunal, the Higher Tribunal of Justice and the Regional Federal Tribunals. The judges are appointed by the president with confirmation from the Senate at a set retirement age of seventy years.